As spring training comes to a close the Giants are still trying to figure out what their opening day outfield is going to look like. 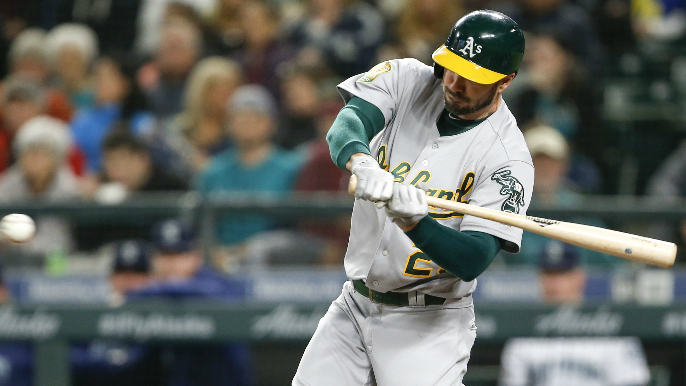 On Wednesday they added another name to the mix, signing former A’s outfielder Matt Joyce to a non-roster deal, according to multiple reports. Giants have signed Matt Joyce to OF mix. Giants signed outfielder Matt Joyce to a non-roster deal. Joyce, 34, was released from his minor-league contract with the Indians on Tuesday. Joyce appeared in 83 games for Oakland last season, posting a rough .208 batting average and a slightly below average OPS of .675. Joyce had strong seasons in 2016 and 2017 with the Pirates and A’s respectively, posting a combined OPS of .828 in 281 games. Joyce has been selected to the All-Star Game once, making it as a member of the Tampa Bay Rays in 2011. A left-handed hitter, Joyce has shown flashes of power at the plate throughout his 11-year career, slugging 25 homers with the A’s in 2017. He also has a well above-average career strikeout-to-walk-ratio of 1.70 (league average 2.41). Joyce will be the third left-handed outfielder in Giants camp joining projected opening day starters Steven Duggar and Gerardo Parra.